This is a low-profile version of our Round Retro Condo, with about half the footprint and designed to rest against a wall. 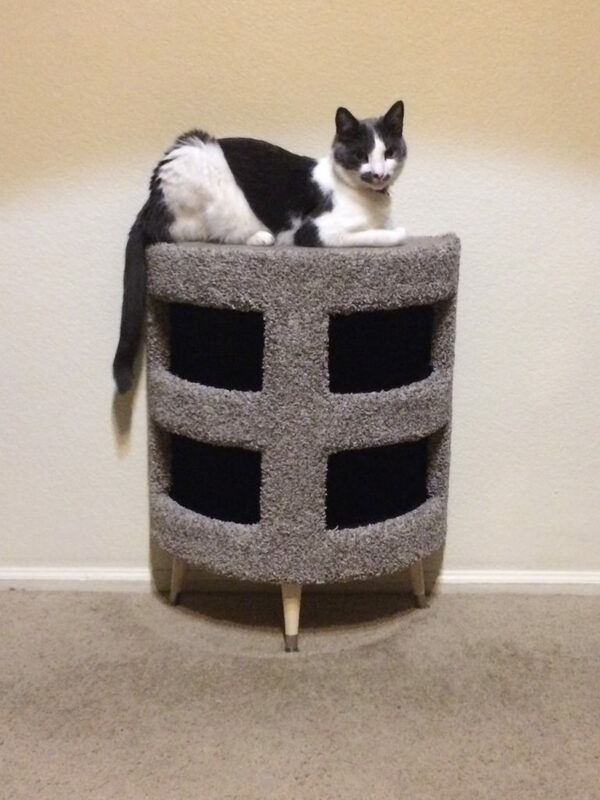 The sturdy half-tube is covered with soft scratchable carpet on the top and sides, and the two floors are carpeted with a complementary color. Overall measurements: 27 inches tall, 22 inches wide, and will stand out 11.5 inches from the wall. Please note that this design must be placed against a wall or other immovable flat surface in order to be safe and sturdy. It does not need to be permanently attached to a wall, but you may choose to do so if you live in an earthquake zone, or have exceptionally rambunctious kitties. A cushy, carpeted low-profile condo perfect for hallways or high-traffic areas.